One of the memes making the rounds in the leftosphere these days is that the media pays way too much attention to the stock market. There’s a lot of justice in this. Day-to-day fluctuations are pretty meaningless, and the media’s longstanding insistence on inventing reasons to explain each day’s results has always been ridiculous. The U.S. macroeconomy has been so tame for so long that it’s impossible to get an accurate reading about depression odds just from the U.S. data. My approach uses long-term data for many countries and takes into account the historical linkages between depressions and stock-market crashes. ….In the end, we learned two things. Periods without stock-market crashes are very safe, in the sense that depressions are extremely unlikely. However, periods experiencing stock-market crashes, such as 2008-09 in the U.S., represent a serious threat. The odds are roughly one-in-five that the current recession will snowball into the macroeconomic decline of 10% or more that is the hallmark of a depression. Now, it’s worth pointing out that almost all of Barro’s data comes from developing countries. There have been only a tiny handful of post-WWII depression-level events in rich countries. 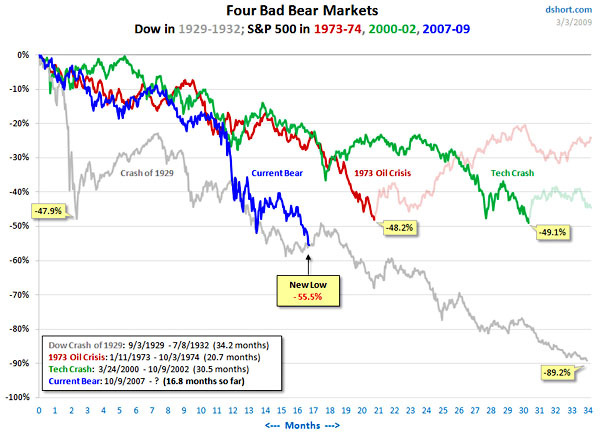 Still, events being what they are, you might say that we are all banana republics now, and if Barro is right the Dow is telling us that we might have as much as a 20% chance of spiraling into depression. That’s worth listening to.